We recently stumbled upon this gorgeous paper flower bouquet on the Hello! Lucky blog. 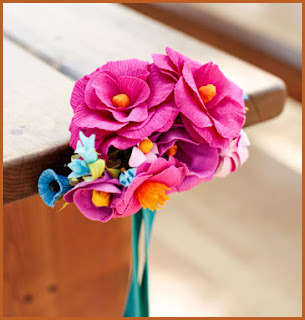 The brave use of color in this bouquet takes full advantage of our bright and brilliant selection of crepe paper. We pass this along to help you with technique as you make your own treasure to enjoy and share during the lazy days of Summer. Thank you Hello! Lucky!